AVAILABLE FROM AMAZON, BARNES & NOBLES, POWELL'S BOOKS ONLINE AND YOUR LOCAL BOOKSTORE (they can order it even if they don't have it on the shelves)! Dill is a duck. A perfectly ordinary duck. At least that’s what he thinks. Then he meets Bizzy, a strange bird. Bizzy seems to think that Dill is actually an odd duck! Together, they find that they’re even more extra-ordinary than they could have imagined. Perfect for anyone who has ever felt a little odd or a tad strange, this delightfully offbeat picture book celebrates the joy of finding a friend who lets you march (or waddle!) to the beat of your own drum. Bizzy the strange bird has decided: Today is Opposite Day! Time to eat dinner for breakfast, have a loud dance party instead of a quiet rest, and say good morning at bedtime. But Bizzy’s best friend, Dill the odd duck, would prefer to have a normal day, with no opposites. So Dill says, “No, no, stop!” to Opposite Day, while Bizzy says, “Yes, yes, go!” Will Opposite Day turn best friends into worst enemies? 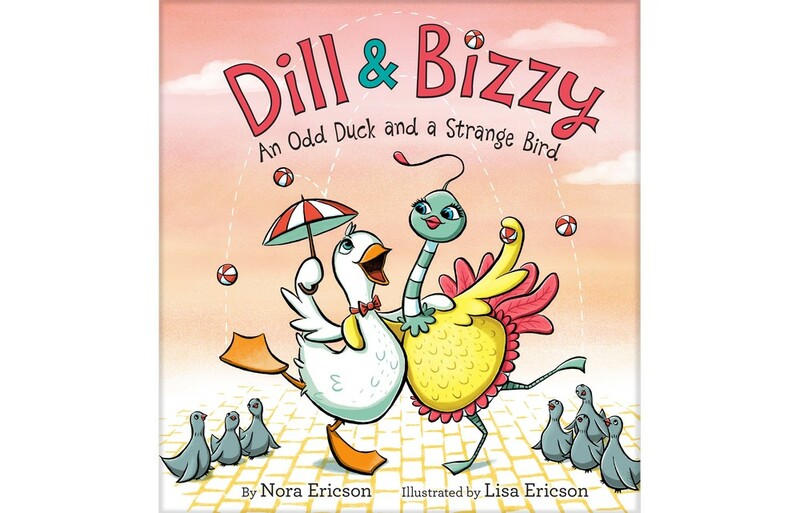 Nora and Lisa Ericson’s playful picture book, Dill and Bizzy: Opposite Day (HarperCollins), combines an original introduction to the concept of opposites with an eccentric but heartwarming friendship story. If today is truly Opposite Day, be prepared to hate this book! Get a FREE Signed Bookplate!